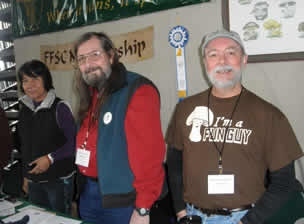 Mushroom clubs put on a fair for various reasons: to fulfill their mission of providing public education, increase public awareness of fungi and their benefits, create publicity for the club, and attract new members. A properly run event should break even or make a substantial amount of money for your club. Planning a fair can seem daunting, so we would like to provide a simple outline for organizing a fair. We invite you to share your mushroom fair date on a central NAMA calendar of events. Send your information (date, time, cost, location and a short blurb) to the webmaster. If you plan to put on a fair, decide on the scope of your event to ensure your plans are manageable and rewarding. Small fairs can be put on by just a few people. More complex fairs require a small army of volunteers and an extensive budget. If you have a chance to attend a fair by one of the clubs in your area that puts on an annual fair, this is a great opportunity to get ideas and ask questions. 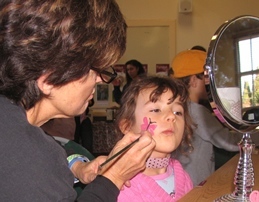 Each fair has its own unique flair and buzz. The following suggestions can be used for a simple, first fair and also includes some new ideas for more extensive, subsequent fairs. The duration of the fair can be as short as just an afternoon or as long as three days. Form a Fair Committee. 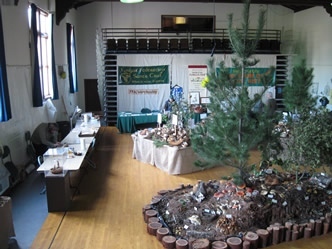 Depending on the scope of your event, there should be an overall Chair with the latitude to make decisions, and coordinators for volunteers, vendors, overall program content, mushroom displays, and educational displays. The committee should start meeting at least 4-6 months before the event. Besides deciding on a venue and creating a budget, there are lots of considerations of logistics, lining up speakers (if you choose) and volunteers, and preparation. Finding a good host site for the fair is the most important logistical consideration. Community centers, schools, local garden centers, churches, town halls, museums, science centers, colleges, botanical garden, arboretum, state fair, library – they’re all fair game. You’ll want to ask about cost and/or revenue sharing, how early can you get in to set up, how they feel about bringing in forest debris and protecting floors, cleanup, permits. Promise to do a great job cleaning up. 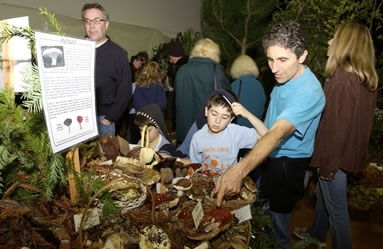 An annual fungus fair can be a rewarding event for a park visitor center or a community meeting place. It gives them visibility in the community as well, and promotes public education. You can have the Fair in one big room or in several rooms if you are providing lectures. Ask for permission to hang things temporarily on the wall. Your agreement with the site should stipulate all costs, how much staff support you need from them, how the space can be used (can you include a cooking demonstration or conduct sales on site?). Make sure that you have a sufficient number of tables and chairs available, either on site or rented, to meet all your needs. 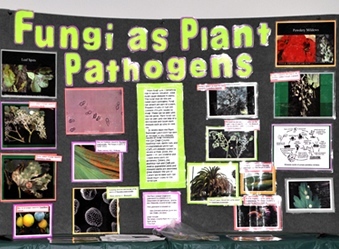 Plant pathogen display at 2011 San Diego Mycological Society fair. © Photo by Gerald Sheine. 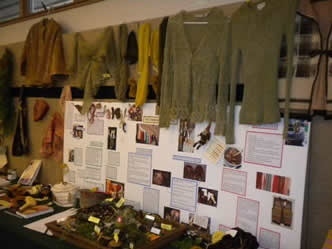 Dyeing with mushrooms display at 2010 Puget Sound Mycological Society fair. © Photo by John Goldman. Get your club members involved in putting on the fair early. Let them know that by donating a portion of their time, they will get into the fair for free. Each person responsible for one area of the fair, such as displays, vendors, should give an estimate of how many volunteers they will need at each station throughout the fair to the Volunteer Coordinator. Give your volunteers assignments that they will feel comfortable with. Some people enjoy being out in front of the public while others prefer to work behind the scenes. If the estimate of total volunteers exceeds your pool of available people, try to enlist local high school students, etc. Be sure to feed your volunteers at critical times during the fair. They’ll appreciate the fuel. While you can never predict how many people will show up for a fair in any given year, the effort put into publicity is invaluable. Use a diverse approach to reaching as many media outlets as you have available in your community. Newspapers appreciate a lot of lead time to cover events, and often need a “hook” to justify sending out a reporter and photographer. Along with television stations, they seem to like looking for mushrooms in natural settings where they can get some appealing forest vegetation in the background. Be sure to give good information to reporters in advance to deter them from using timeworn catch phrases about mushrooms. Media often try to develop their own hook by focusing on how weird mushroomers are. Try to steer them away by referring to the scientific work that your organization does, or facts about how much protein there is in cooked mushrooms. Garden clubs and master gardener programs seem to have a special interest in mushrooms and are willing to help spread the word. Produce a succinct press release and mail it to as many media outlets as you can. Follow up with a phone call to the producer if you have any connections with stations or newspapers. Advertise the fair early on your website. If you create a page just for the fair, give a link to that page to the media, with a contact person to handle their requests for information, interviews and photos. Also, think about using social media such as Facebook to generate interest in the fair. 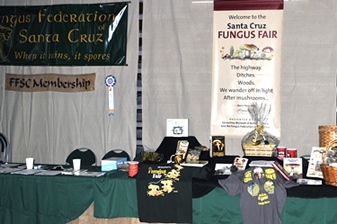 The Fungus Federation of Santa Cruz, for instance, has created an entire website just for public information for their fair. Many clubs create a poster for the fair and distribute it widely in shops and billboards around the community. Some clubs create a postcard size version of the poster for mailing to people who might be interested in attending, or who attended the previous year’s fair. Color posters and postcards can be expensive to produce. See if you can find an organization or printer who can defray part of the cost. If someone in your club is good at videos, ask them to do one for the fair, including interviews with some of the organizers and visitors. Add the video to your website or YouTube to promote the fair the following year. Contact schools about the fair. Invite science teachers to participate in the pre fair forays and bring their students to the fair. Let teachers know about the resources on the Education Section of the NAMA website. Organize forays to several locations from a day up to a week before your fair. This is a good time to engage some of your prospective members. People, at least in our experience, love to collect mushrooms for displays and science and are willing to donate their time. This experience also gives people a chance to become acquainted with your club members. You’ll want to ensure that everyone follows your protocol for collection – extract the whole mushroom, for example. Notes about location, associated habitat, growing on ground/wood/in grass, can be helpful to your team of identifiers. Often, when hundreds of mushrooms are collected for the fair, there is a rush to identify them as quickly as possible. Be sure to have enough good identifiers on hand to be accurate. Save duplicates of fungi to replace those on the tables that rot or dessicate, or use them to create a central showy display. 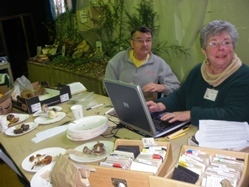 At the fair, have mushroom experts at the tables to answer questions and to ID mushrooms brought in by the public. Microscopes and books should be available for ID. Keep a spray bottle handy and ask one or two volunteers to spritz the displays every so often to keep them fresh. A crush of people can heat a room quickly. Replace old specimens with fresher ones, if available. 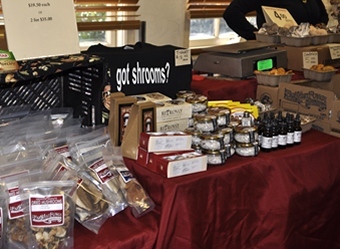 First and foremost, mushroom fairs should focus on engaging mushroom displays. Most visitors will give kudos to the fair’s other aspects, but they always remember their first view of remarkable displays of fungi, the most they’ve ever seen in one place. Display tables are most engaging when they have realistic habitats, decorated with authentic forest debris and living forest materials. 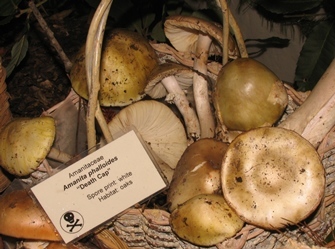 Mushrooms can be displayed on natural duff or on plates. Group them by habitat, stature, families, spore color, or any other logical grouping. Use fresh or dried specimens. 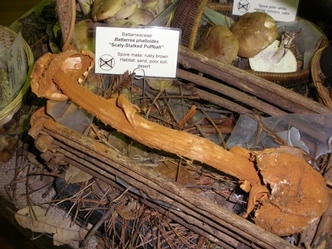 The Southern California Clubs have a display of dried desert fungi. Some clubs create specialized structures to hold materials so that the display can be built year after year with the same material. The Fungus Federation of Santa Cruz uses baskets filled with sand and then covered with duff into which each species is placed. Identify each species with its Latin name and common name if available. Information about edibility is a welcome addition. Business card size blanks are useful for this information. Pins can be used to stand up the card in your display. Adding story boards and genus information adds to visitors’ experience. To help people learn about fungi, create some informational storyboards with basic information. Post these in places where people can spend time looking at your creations. Assume that most of the public has no idea what mushrooms are or their role in ecology of the forest. Consider creating a central display, a sort of natural fairyland if you will, that highlights showy macrofungi. Smell and touch areas are fun for people new to mushrooms. Show people some of the unique characteristics of fungi, their aromas, spore prints and staining reactions. Be sure to staff this area with someone to explain the exhibit and provide information at each station about what to see. If your club has beautiful mushroom art (photos, pictures, previous years' t-shirts, ceramics, etc. ), create displays around the fair for people to see. Along with directional signage, this is a good use of available wall space. Special displays for kids are very popular. More on that later. Make the space you choose work for you. 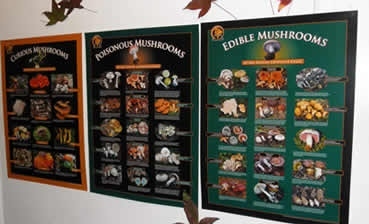 Mushroom displays should be the prominent part of the display. Anticipate crowds at the tables and arrange them for good flow of people and to satisfy local regulations on handicapped access. Some clubs arrange tables with room for knowledgeable club members to stand behind and talk with visitors. sales, including books, magazines, posters, t-shirts, mushroom vendors. membership and entry fee table. lectern, microphone and audience chairs for cooking and cultivation demos. 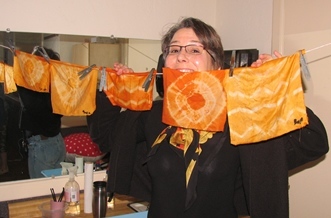 dyeing and papermaking display and workshop, lichen display, etc. space and equipment for playing mushroom videos. mushroom photos and artwork, with permission, can be hung on the walls. Use double-sided tape that can easily be removed. a separate room for lectures such as beginner talks (Mushrooms 101), talks by club members or professional mycologists. At the FFSC fungus fair, Christopher Hobbs creates a very attractive display as a backdrop to speaking with the public about medicinal uses of mushrooms. Hobbs has created several storyboards. © Photo by Gerald Sheine. Take the time to create some educational and interactive displays. Most people have never seen mushrooms up close. Create some basic poster size displays to describe introductory level material for the general public. 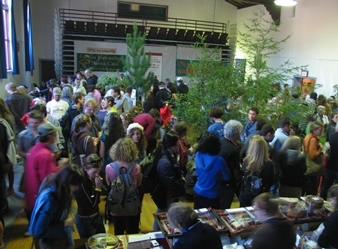 The three posters on the right were created by a team of three young mycologists for the Fungus Federation of Santa Cruz. Some popular areas at fairs include mushroom features under a dissecting microscope or views of spores on a compound microscope. Some venues will not allow merchandise to be sold on the premises, or may limit sales to a small area of the fair. Be sure to check this when you reserve space. 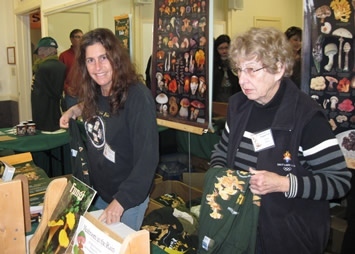 Most often, to raise money, clubs set up a sales area of their own. Mushroom field guides and cookbooks are available from publishers at a discount and can be resold at or just under full value. T-shirts are a popular item among visitors, as are cloth bags, coffee cups with the club logo, calendars, etc. Be creative but don’t stock a lot of kitch. Unsold items eat into your profit margin. See how sales go the first year and then build on what sells best. 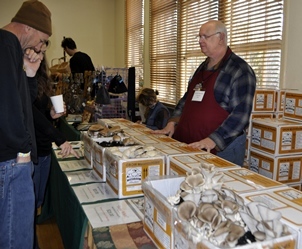 Vendors can add a great deal of charm to a fair, from dyed mushroom fabrics, pottery, mushroom growing kits, mushroom jewelry, framed pictures, cards and stationary, to cultivated or wild mushrooms. Either charge the vendor a set amount for their space, ask for a portion (5-10% of gross sales), or both. Be sure to set up clear communications with vendors before the fair so there are no misunderstandings. They can be very competitive. Your fair might include a cooking demonstration or food sales. Be sure to check with local authorities about what permits and inspections might be required. Multiple permits to satisfy local authorities can be costly. Food sales help keep visitors at the fair longer, and can provide a small profit. They also increase the amount of volunteer time prepping food (such as a mushroom soup) before the event and staffing at a food station. 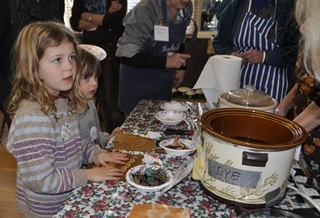 Cooking demonstrations require space and seating and ventilation; if you tackle this, make sure to have a good understanding with the cook about time, product, and participation by volunteers in the preparation of ingredients on site at the fair. Most people know mushrooms through the button mushrooms they buy at the supermarket. Others associate wild mushrooms with a meal they’ve had in a high-end restaurant. Try to engage some of the local restaurants, preferably those that already use wild mushrooms in their dishes, to sponsor the fair, to find a chef willing to put on a cooking demonstration, or host a special mushroom dinner before the fair. A series of mushroom dinners in restaurants around town can generate a lot of interest and boost attendance. Depending on the amount of room, following are some suggestions for children’s displays and activities. Use a compound microscope along with camera and computer to view spores and other microscopic features. 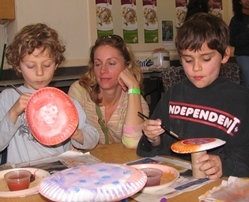 Kid's enjoy (supervised) dyeing fabrics using mushrooms. Crayons, markers, pencils, glue sticks, paint, clay, bread dough, scissors, white copy paper, colored paper, ink pads and mushroom stamps, large magnifiers on stands (used to look at fresh specimens), dissecting microscope, compound microscope with digital or video camera attached to computer to view slides of spores and microscopic features on the computer screen. Fairs are often where clubs sign up a substantial number of new members. Have a table set up for people to learn about your club and its activities. Be sure to have extra membership applications on hand for people to sign up on the spot. Include flyers about your website, discussion group, meetings and activities. Ask everyone who pays admission to give you their email address for followup with the caveat that you won’t pester them with unnecessary messages. Make the membership table visible with a large sign or banner so people know who you are and how to find you. Be sure to cover the cost of putting on the fair with a reasonable admission charge. Fair admission can range from totally free, to voluntary donations, and to a set price. 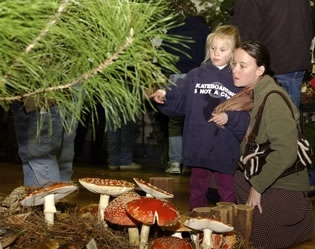 If the fair is held inside a venue such as a botanical garden that charges admission, then the mushroom fair may be free. The club can make some money from sales or raffle tickets. 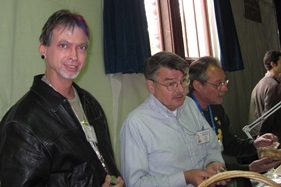 Many thanks to Lee Yamada who provided so many suggestions for running a Mushroom Fair. 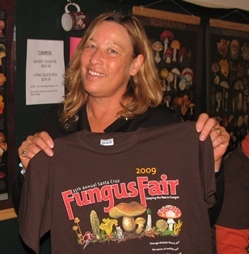 Lee was in charge of the Fungus Federation of Santa Cruz Fair for many years. Thanks, also, to David Rust for his input of additional ideas and for editing. He has organized several successful fairs in Oakland and at the Point Reyes National Seashore, and is webmaster for bayareamushrooms.org. Send your suggestions and photos to ssheine [at] aol [dot] com.